Without sales, you hardly have any chance of growing your company. Therefore, spending time, resource and energy on sales and marketing never really goes to waste. And this is where sales tools for startups come into play. Unfortunately, many sales professionals focus on the wrong aspects of the whole sales process. For example, some of them are mostly concerned about managing their sales funnel rather than concentrating on closing deals. Luckily, the internet is inundated with a myriad of automated sales tools for startups that can manage the whole sales process for you. So, now you don’t have to worry about missing out on something vital. AeroLeads is included in almost every “best sales tools” list on the internet, and for all the right reasons. One of the most important factors that can be accounted for its success is its ability to curate information in real-time. This enables the tool to keep provide relevant, as well as reliable information. On the other hand, information stored in databases stands the chance of getting stale. AeroLeads has a chrome extension of its own that allows its users to capture contact information in real time. Curates reliable information in real time. Extracts prospects’ information from platforms like Google, LinkedIn, Crunchbase, AngelList and more. Pricing – AeroLeads offers a free trial option which can help you get the hang of the tool before opting paid packages. The paid packages start at $ 49 per month and go up to $499 per month. They also offer a customizable package that can be personalized as per the preference of an individual or a business organization. 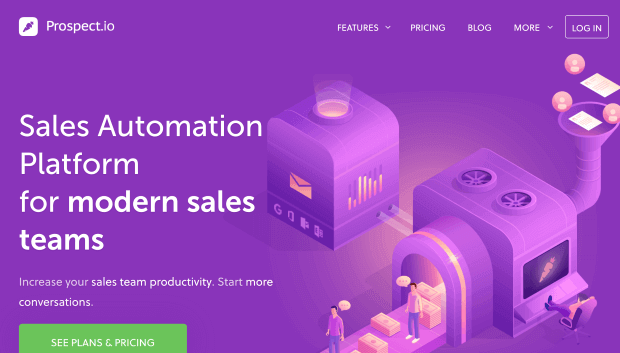 Sales Automation Platform for modern sales teams – Increase your sales team productivity. Start more conversations. Prospect.io fits the bill perfectly if you are seeking the attributes mentioned above (in their catchphrase). It is touted as one of the best in the market, especially when one talks about CRM and sales tools for startups and enterprises of all sizes. It handles both prospecting as well as lead nurturing process. Allows you to track your leads, while continually optimizing your campaigns across every channel. Provides a reliable email verification tool and help you automate your outreach via a range of pre-existing templates. Prospect.io is fully integrated with tools like Salesforce, Pipedrive, Close.io, and HubSpot which makes it even more effective. Other things that Prospect.io sales tool has to offer includes a powerful email tracker which allows the user to know exactly when the prospect opened up their email. Apart from this, the email tracker is also capable of answering questions like whether the prospect signed up for the newsletter or not? To make it more effective, it also tracks the number of clicks on your links along with the replies from your leads and prospects. 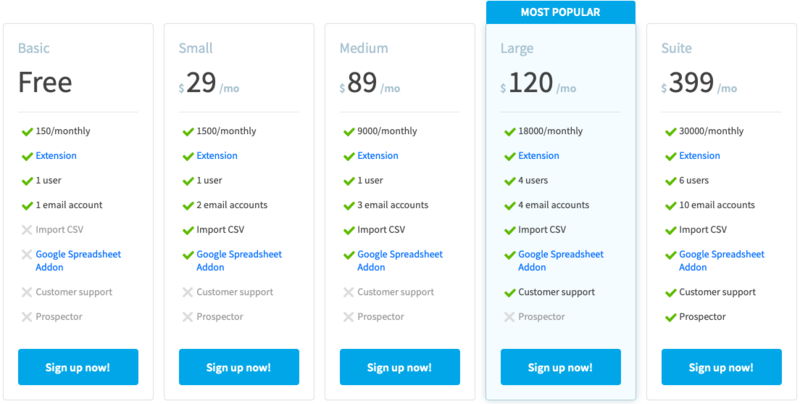 Pricing – the pricing options for Prospect.io starts from $99/month to use up to 1,000 credits and goes up to $1,699/month to use up to 100,000 credits. Prospect.io is a tool for every sales professional and is a perfect fit for organizations of every size and reach. Reach more customers and close more deals using a suite of tools. Reaching out to customers can be done manually, especially, if you don’t have many people to reach out to. That said, you are still better off using an automated sales tool like FindThatLead considering that it is always a good thing to increase your outreach. 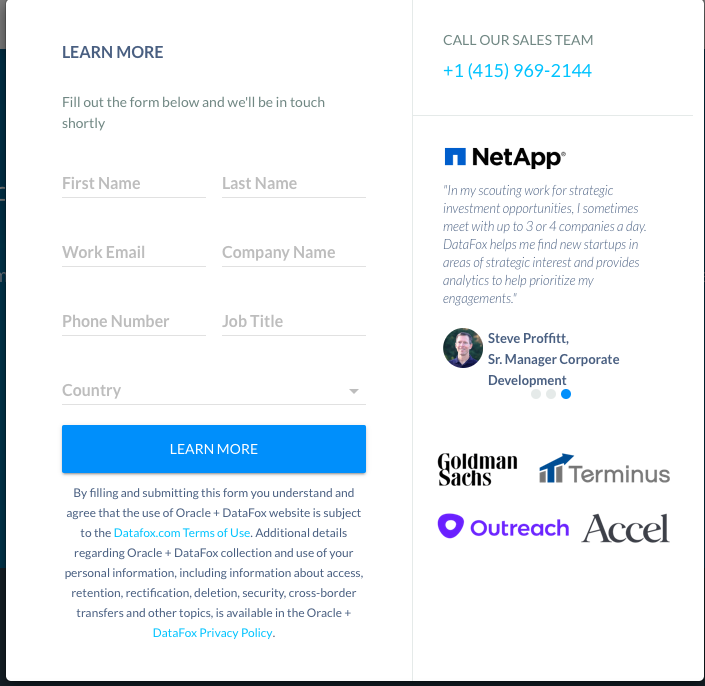 Getting in touch with your customers directly using verified email addresses by FindThatLead. Find email addresses of your potential customers using URLs of their social media profiles. Verify email addresses individually or in bulk. Build targeted email campaigns that include analytics in order to boost your business growth. Discover new segments on the basis of attributes like location, position title and more. Pricing – Although FindThatLead offers a free package as well, the paid packages start from $29/month and goes up to $399/month. Since the tool offers a free package, there is no reason why you cannot give it a try at least. Even if you’ve never used any sales tool in the past, this could be the push that you need to take full advantage in the future. 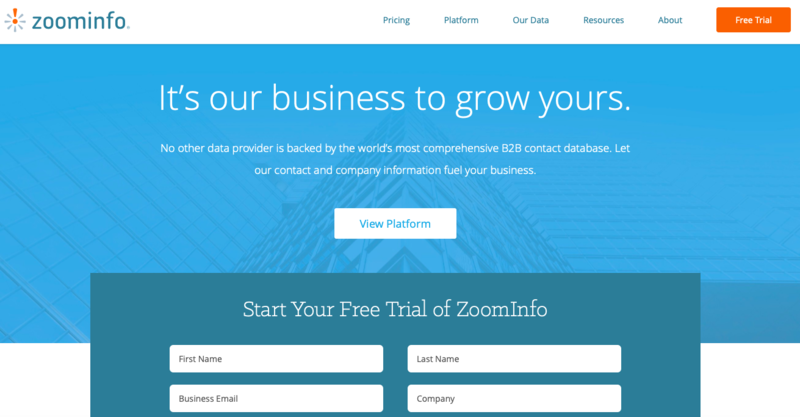 ZoomInfo claims that it’s their business to grow yours. And given their massive experience, ZoomInfo definitely lives up to the claim. 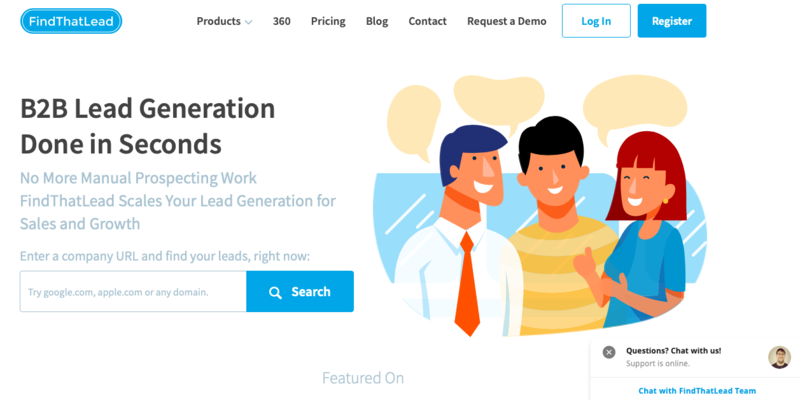 Poised as one of the best-automated tools for sales and marketing in the industry, ZoomInfo is a fitting mention in this list. Provides powerful insights about the prospects and potential customers. Allows users to enhance their database. Users can search for their leads based on industry, location, company size, company revenue, and more. Organize and manage your database to keep up-to-date. Pricing – ZoomInfo doesn’t offer fixed packages. You have to get in touch with them in order to get custom packages and pricing details. However, they do offer a free trial. The InsideView is a targeting, marketing, and sales intelligence platform. With the help of InsideView sales tool, you can equip yourself with a tool that will help you reach out to all your prospects and reach all of your goals. Industry-Leading intelligence data – offers the most current and accurate data of the companies and the prospects. The tool provides real-time insights into the relevant topics regarding the industry. Builds a private network so that the user can connect to the colleagues and prospects. Procures company and contact information from editorial sources like Reuters and NetProspex, and social media from LinkedIn, Twitter, Facebook. Creates targeted lists to reach the right prospects at the right time. 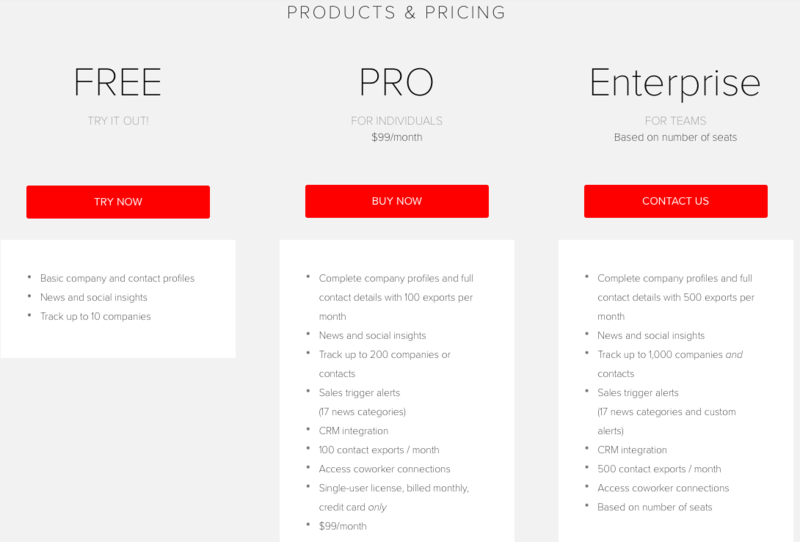 Pricing – SalesView offers a freemium package. The paid packages start from $99/month, called as “Pro Package” for individuals. Apart from this, they have an “Enterprise package” for a whole team of professionals. It is easy to use and contains all the information needed for marketing research, sales prospects, and intelligence needed for meetings with prospective clients. 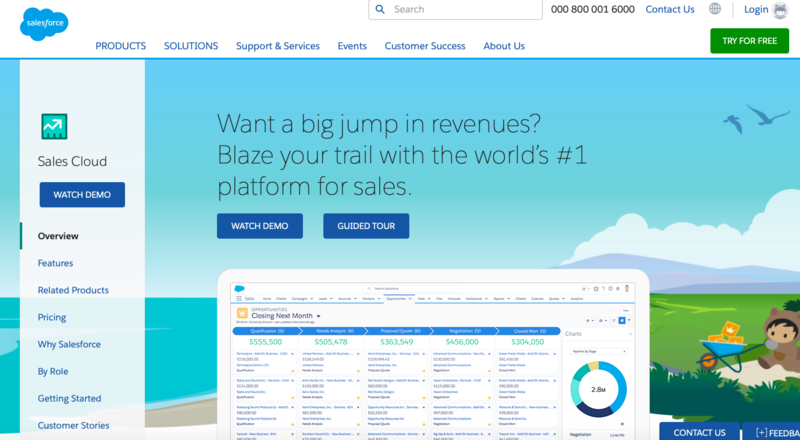 This sales tool works coherently with SalesForce and allows you to import data directly into SalesForce. One of the most popular features of the DataFox is its ability to upgrade the CRM with intelligent company data. This way you can stay up-to-date with the happening in the industry and can update it at the same time. DataFox provides AI-sourced, human-audited company data, which you can update in your CRM at the same time. Push intelligent account data into your leads, contacts, and accounts. Helps the users identify and prioritize their prospects. Pricing – To get to know about their pricing details, you would have to contact their sales team directly, either by placing a phone call or by filling their form. RingCentral is a cloud business solution provider that offers flexibility, scalability, and customization for the needs of any B2B organisation. RingCentral offers seamless integration with various other platforms including SalesForce. It merges cold calling with other attributes of sales management. It helps its users increase call efficiency, drive organisational collaboration and enhance customer interaction. RingCentral can also be integrated with Box, Desk.Com, Dropbox, Google, Microsoft, Oracle Sales Cloud, ServiceNow, and Zendesk. Pricing – Their packages start from $19.99/month, called “Essentials” and can be used by up to 10 users and goes up to $49.99/month, and can be used by unlimited users. This sales tool also offers features of making or receiving calls through RingCentral, directly from your account within SalesForce. SalesSeek perfectly merges sales and marketing into a single solution that offers features like pipeline management, email marketing, automation, web analytics and more. It offers web analytics with real-time alerts so that the user can take prompt action. Also assists in lead generation and tracking, email marketing and automation. Optimizes business deals & sales funnel management. Pricing – Apart from the “Basic Package” as well as the “Professional package”, they offer a customizable package called “Enterprise package”. A sales CRM built for minimum input and maximum output. Pipedrive is one of the most useful sales tools, especially for small to medium-sized teams. It provides you with an easy-to-use as well as an effective sales pipeline management. Allows you to have an insightful overview of your sales process. Other features include contact management, sales forecasting, performance metrics, opportunity management, customer database and email integration & tracking. This sales tool is great at forecasting agreements. It also has integrations with other software such as Google Apps, MailChimp, and Zapier, allow for a seamless deal process. Pricing – Please note, that you can save up to 17% if you avail their annual package options rather than the monthly one. Get closer to the right people using LinkedIn Sales Navigator. You might be interested in knowing that LinkedIn has more than 450 million registered users. With such massive potential, no wonder LinkedIn Sales Navigator is one of the best sales tools in the industry. LinkedIn Sales Navigator optimizes your sales and marketing campaigns. Sends personalized lead recommendations to its users. Offers access to advanced search options. Users have access to analytics so that they can track their social selling results. Pricing – They offer three packages in total. While the prices of the first two are given, the third package is a customizable package that can be tailored according to the user’s need. With a free trial, there’s no harm in giving this sales tool a try. EverString empowers its users with powerful insights into the companies they want to close deals with. Apart from viewing the company details, the users also have access to technographic and other insights without ever leaving your CRM. Pricing – Everstone has not mentioned price details on its website. However, pricing for software similar to EverString ranges from $9 to $30 per month for the basic platforms, while more premium and extensive ones usually range from $100 to $300 per month. What are the other sales tools that you use? What benefits are you achieving and would you recommend your practice?